The Lambent epidemic might be over, but there's a new menace threatening Sera - and a new generation of heroes ready to fight it. Set a quarter century after the events of the original trilogy, Gears of War 4 is the fifth game in the popular Xbox franchise, and the first to be created by The Coalition (who've taken over the series reins from original developer Epic Games). 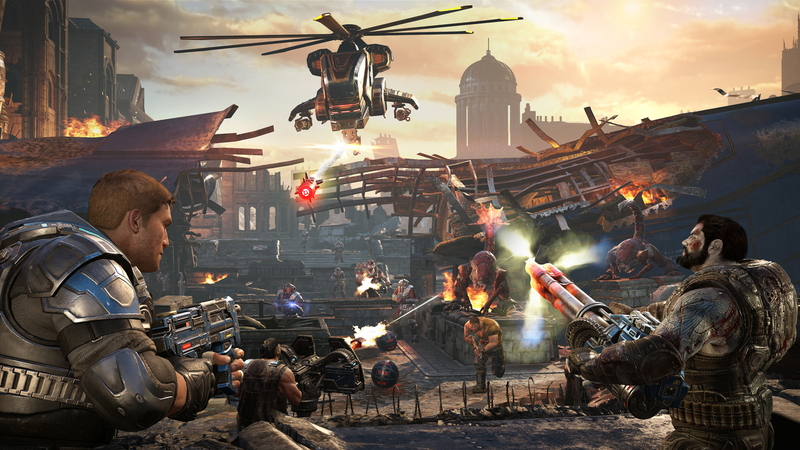 It's a third-person, cover-based shooter that features a trio of gameplay modes: Horde 3.0 survival, multiplayer PvP, and a one- or two-player local or online co-op campaign. The latter follows the exploits of three young friends as they face a new threat to the remnants of humanity, who are slowly rebuilding Sera following the devastating Locust Horde and Lambent epidemics. It's a fractured world in which most of the population lives in walled-off cities, and where the Coalition of Ordered Governments, led by First Minister Jinn, has instituted martial law to keep the civilians safe from harm. This perceived oppression has resulted in some members of society leaving the cities to form their own settlements away from the COG conurbations. Known as Outsiders, these independently-minded people conduct raids on COG construction sites to garner resources for their communities. This has caused friction between the two factions, and as citizens start to mysteriously disappear from COG cities, the government accuses the Outsiders of these "kidnappings." However, the Outsiders are not to blame… but who is? 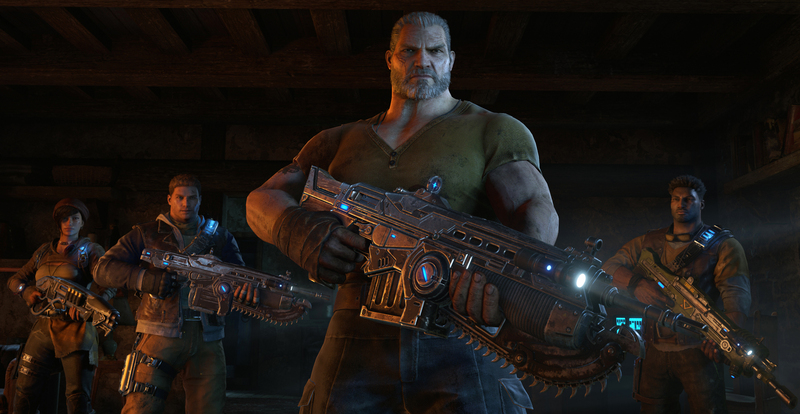 Gears of War 4 opens with a quite explosive prologue that cross-cuts a 25th anniversary remembrance speech from First Minister Jinn with high-energy action sequences in which the player participates in moments from the wars of the original trilogy. 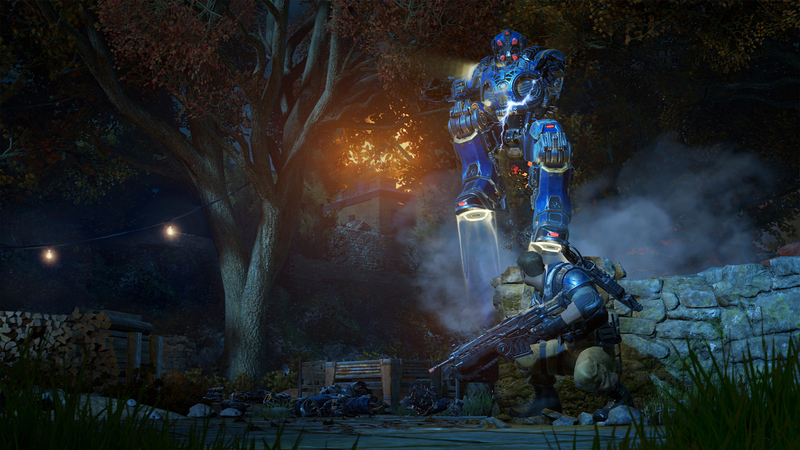 Ordinance detonates, bullets zing, and enemies are everywhere. You even get to deploy a Hammer of Dawn on some of the bigger monsters in classic style. It's a great introduction to the series for those who haven't yet played Gears of War that essentially doubles as a training mission. By the time the sequences are finished, you're effectively brought up to speed on the game's shooting and movement mechanics. Following those breakneck introductory vignettes, the proceedings then settle into the story proper, focusing on four Outsiders – JD, Del, Kait, and her ex-Gear veteran Uncle Oscar – as they conduct a raid on a COG facility. The player takes control of JD, son of a certain Marcus Fenix, who is essentially the leader of the group. It doesn't take long for things to heat up, with the quartet having to survive the onslaught of a windflare, a devastating cross between a tornado and a lightning storm that's become commonplace since the Imulsion Countermeasure weapon was deployed 25 years earlier, and then take on an army of security droids that have been deployed to protect the COG site they're trying to steal from. The objective of the raid is to nab a fabricator, a kind of industrial 3D printing device that can be used to create weapons and defensive installations. Once it's located and taken back to JD's Outsider encampment, the COG steps up the pressure, and attacks the village, kicking off a set-piece firefight between COG security forces and the heroes. Needless to say, the latter prevails – but it comes at a high cost: The village is almost razed to the ground. Later on that night, there's a second raid – but this time it's not the COG. It's something new and far more sinister. The three friends survive the encounter, and subsequently discover that everyone in the village has been abducted. There's only one option – JD needs to return to his childhood home and ask his father for help. And so begins the real adventure as JD, Del, Kait, and Marcus battle COG forces, as well as a new threat in an highly kinetic adventure that spans five acts, each incorporating between four to five gameplay sequence "chapters." The action is articulated through a mixture of cinematics, cut scenes, and gameplay that blend together almost seamlessly to create a visually impressive narrative. I particularly enjoyed the well-written and voiced dialog between characters, which adds a lot of personality to the game and delivers moments of levity as the heroes work their way through the gorgeously-rendered ruins of Sera, battling a seemingly endless horde of enemies. 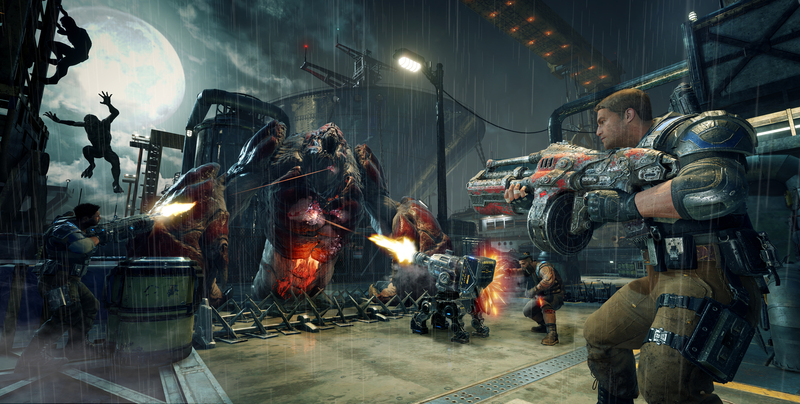 The game very much looks, feels, and plays like a classic Gears of War release, with its beefy characters running from cover to cover using a variety of familiar firearms, including the Gnasher, Lancer, and Hammerburst – along with a few new weapons such as the Buzzkill, Dropshot, and melee-oriented Combat Knife. The new additions are quite entertaining to wield and can deliver some quite spectacular kills, but they seem to be designed around limited use only. Most of the time I found myself relying on my trusty Lancer and Hammerburst, which were my weapons of choice when it came to most firefights. Speaking of which, Gears of War 4 is absolutely packed full of them. From skirmishes in the confines of dark, narrow corridors to larger-scale combat sequences that play out in wide-open spaces, the game presents a varied and challenging array of battlefield conditions. Although the action can feel somewhat relentless at times – indeed the characters even crack jokes about it in some quite amusing between-fight banter – I enjoyed working my way through enemy-infested territory. Oftentimes, you're dealing with a variety of threats simultaneously, from small, fast-moving enemies to heavily armored tank-types that slowly plod towards you emitting a hail of gunfire. The end result is a quite intense and dynamic-feeling shooter, where you have to stay on your toes to avoid getting flanked and overwhelmed, and use cover effectively so you're not shot to pieces. 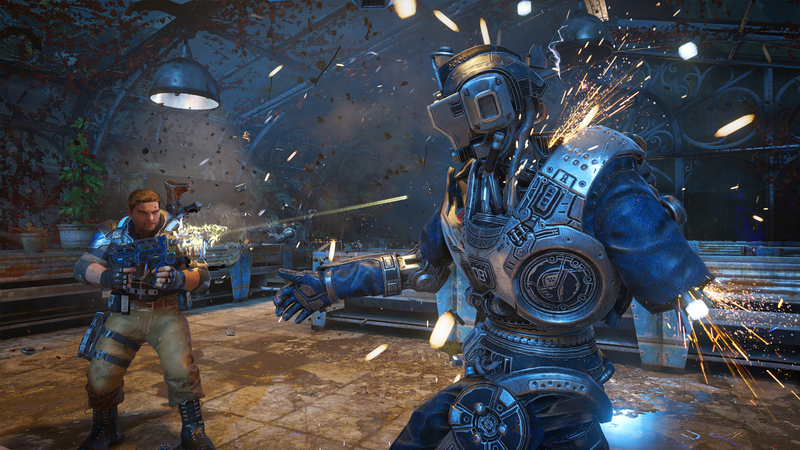 As you might expect from a Gears of War release, there are also boss fights to contend with. Not many, it must be said, but the game's handful of major set pieces are graphically rich, and quite spectacular. I'm not going to talk about them in detail, since I don't want to spoil the game, but what I can say is that they're a lot of fun. They're all essentially shooting galleries, but some involve a few simple additional gameplay mechanics that help make them feel different to the game's regular firefights. Overall, Gears of War 4's campaign is well designed, gory, and action-packed. It does feel a tad short at around seven and a half hours in length, give or take depending on the difficulty level that you choose, but for the most part it's a quality experience that's tight and very well produced. The story is engaging, and while there are a few clichéd moments here and there, the dialog between characters is excellent. One thing that did disappoint me, however, is the game's ending – it's really abrupt. Again, no spoilers, but the action draws to a conclusion just at a point where things are getting really interesting. Of course, it leaves the door wide open for a sequel, but even so, I was definitely left wanting more. Still, that can be construed as a good thing – the game didn't wear out its welcome, and I'm really looking forward to seeing what happens next. In the meantime, Gears of War 4 has another two modes to keep me busy: Horde 3.0 and multiplayer PvP. The former is a survival mode for up to five players where the objective is for you and your team to battle through fifty waves of monsters, every tenth of which is a boss fight. Between bouts you get the chance to use a fabricator to build up your defenses with gun emplacements and barriers, and then it's game on. The mode features five different classes to choose from; engineer, sniper, soldier, scout, and heavy, each of which has a different loadout and playstyle. All characters are capable of reviving one another – something that becomes increasingly important as the game goes on. I haven't put too much time into Horde 3.0 so far, but what I've played of it, I've enjoyed. It's simple and straightforward, and really tests your teamwork and accuracy, especially later levels where the overwhelming numbers of rampaging enemies ensure that you have to make every shot count. But while Horde 3.0 is a neat addition to the game, for me, Gears of War 4's multiplayer PvP is where its longevity is to be found. The game features six different modes, all of which are five versus five. Team Deathmatch is self-explanatory, while Dodgeball sets you the objective of eliminating the entire opposing team. The twist, however, is that the only way a downed player gets to respawn is if a teammate takes out an enemy. King of the Hill involves capturing and holding nodes, and Arms Race is similar to Team Deathmatch, except that every three kills sees your team's weapons get upgraded. Guardian is another mode where it's all about killing the opposing team, but this time each team has a leader who must be protected at all costs. While they're alive, their teammates are able to respawn, but if they're eliminated, there are no more respawns. Finally, Warzone is another team elimination game where players only have one life. 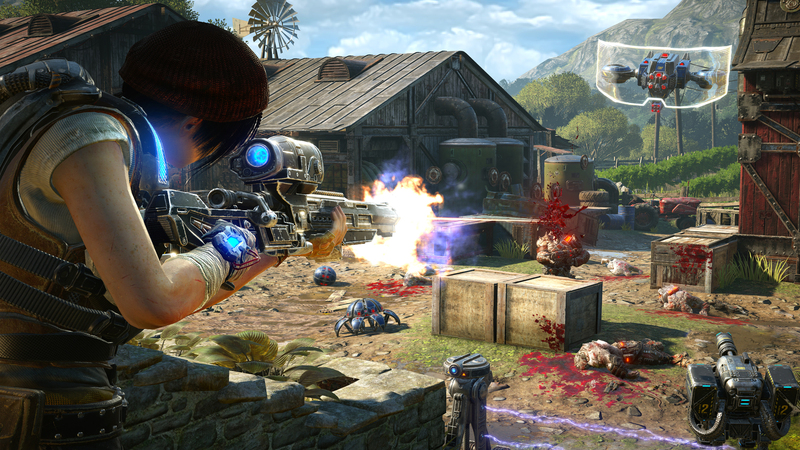 It's an interesting selection of game types that work well with Gears of War 4's fairly small-scale skirmishes to deliver some really exciting action. Warzone is particularly tense, since you have to be very careful about not getting picked off quickly, and Dodgeball's comeback mechanics can create some really clutch moments. King of the Hill requires a more strategic approach as you move from cover to cover to assault a node, but for me, Guardian is the most entertaining mode. It requires really good teamwork to effectively protect the leader, while moving in on the enemy's. That can give rise to some really brutal firefights, with both teams duking it out to gain the upper hand. An aspect of Gears of War 4's PvP that I really like is that players are able to set up private matches with bots. Using this mode, I've been practicing the game on the top "Insane" difficulty level, and the bots play surprisingly well. Of course, they're nowhere near as good as a decent human player, but nevertheless they've really helped me improve my skills as a relative Gears of War PvP beginner – my only prior experience with the franchise's PvP is with the first game in the series. The other thing that's appealing about this game's PvP is that it has a very different feel to the likes of Destiny, Battlefront, and CoD, largely due to its cover mechanics, and combat generally feeling a lot more up-close and personal. Sure, there are some devastating long-range weapons in the game, but if you're careful and use cover correctly, most encounters play out over a relatively short range. It makes for a quite intense, close-quarters game where you need to be quick on the trigger, and know how to use your takedown moves effectively. To that end, there are a couple of new cover mechanic kills in your arsenal, namely the yank and shank, which can be devastating if used correctly on an enemy hiding behind cover, and the vault kick, which is a move that enables you to leap over cover and knock back an enemy. Both can be tricky to pull off, but when they work, it's really rewarding. Another feature that's new to multiplayer PvP is a loot crate system. Credits are earned by playing matches that can be used to buy four different tiers of loot crates, which contain cosmetic items like weapons and character skins, and special-use bounty cards that give you experience boosts or extra credits for hitting a certain objective, such as getting 10 assists in a match, or scoring 1,000 points in Dodgeball. It’s a well-established concept that we've seen before in games like Titanfall and Halo 5: Guardians, and it helps add a little extra depth and interest to the proceedings. As a package, Gears of War 4 is a solid offering. Although the Campaign doesn't quite have the epic warfare scale of some of the previous entries in the franchise, I really enjoyed its storyline. It feels more like an action-adventure than an all-out war, but it still delivers plenty of tense and exciting set-piece battles that are a series hallmark. Horde 3.0 is an entertaining mode for those who enjoy very focused firefights, but really, it's the multiplayer PvP that's this game's long-term proposition. 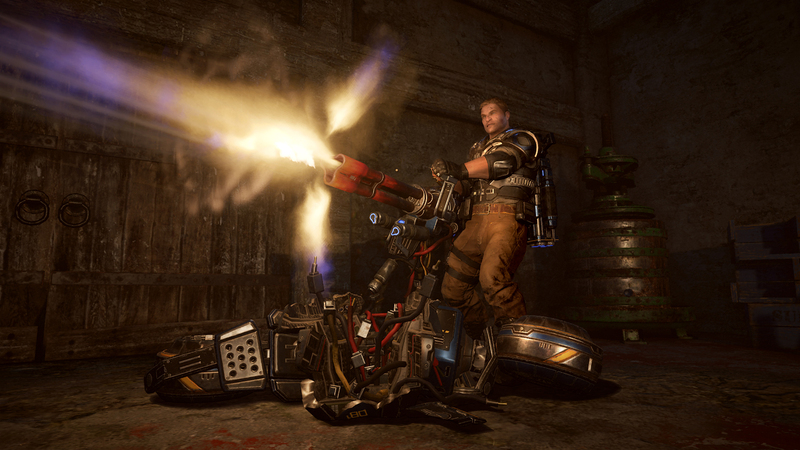 It's perhaps a little light on modes, but what's there is a lot of fun: It follows the classic Gears of War formula that I think fans of the series will really enjoy. The menu system is thoughtfully put together to make navigating through the game's multiple modes quick and easy. Although the campaign is a little on the short side, the game's Horde 3.0 mode and especially its excellent multiplayer PvP offer plenty of lasting appeal. The game's soundtrack suits the action perfectly, and the sound effects are outstanding. Gears of War 4 is a great-looking game, from its slick cinematics to its gorgeously-detailed characters and backdrops. Tagged with PC,	Reviews,	Xbone,	Xbox One.